The demand within the global dairy blends market has been rising on account of the expansive usage of dairy products in the food and beverages industry, finds Transparency Market Research (TMR). The global market for dairy blends displays an intensely competitive vendor landscape wherein several players are overhauling their business strategies to gain a competitive advantage. The fragmented nature of the competitive landscape has had little effect on the bar of competition because the demand for dairy blends has been rising at an astral rate. The entry of new players into the global market for dairy blends is a recurring phenomenon as the market offers commendably lucrative growth opportunities. Over the past decade, the leading market players in the global dairy blends market have been focusing on enhancing the quality of their blends in order to outdo the escalating competition. It is projected that the smaller market players would crush under the weight of increasing production volumes of the larger players. However, formation of strategic alliances and partnerships amongst the smaller players could acts a saviour for these players. Furthermore, the large market players in the global market for dairy blends are on a spree of acquisitions and have already taken over several defunct market players. A report published by Transparency Market Research (TMR) finds that the global dairy blends market would expand at a steady CAGR of 5.80% from 2017 to 2022. Furthermore, the global dairy blends market is expected to accumulate revenues as high as US$3,789.3 mn by 2022-end, rising up from a value of US$2,853.7 mn in 2017. On the basis of product type, the demand for dairy mixtures has been rising due to their huge-scale usage in the food industry. Based on geography, the demand for dairy blends in Asia Pacific and North America has been touching new heights. The demand within the global market for dairy blends has been escalating on account of the growth of packaged food industry. Dairy blends, although artificially manufactured, serve a number of health benefits and are approved for consumption by several food inspection organisations. This is expected to given an impetus to the growth of the global market for dairy blends in recent times, and has even provided a launch pad to the growth of the market players. The demand within the global market for dairy blends has traced an upward graph due to low fat content and low calories in dairy blends. However, a number of food manufacturers still prefer to use conventional dairy products to maintain the freshness and healthiness of foods. This factor has placed a negative toll on the growth of the global dairy blends market in recent times. However, the global market for dairy blends is expected to keep expanding as food administrations across region give a seal of credibility to these blends. The growing food and beverages industry is also expected to keep driving demand within the global dairy blends market in the years to come. 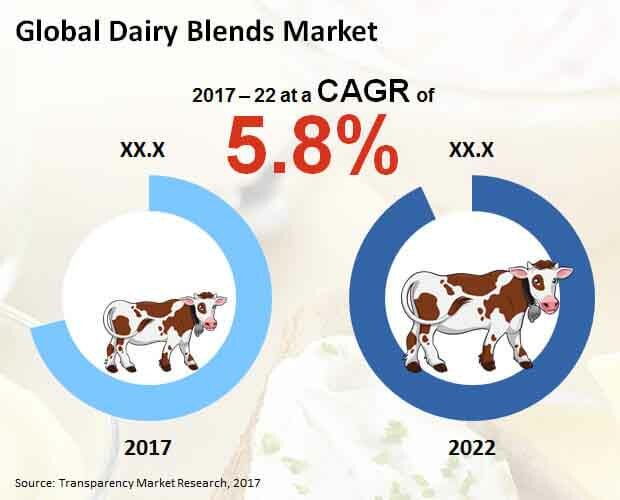 The review is based on TMR’s report titled “Dairy Blends Market (Product type - Dairy Mixtures, Dairy/Non-Dairy Ingredients, Functional Ingredients, and Carrier Dairy Blends; Form - Powder Dairy Blends, Liquid Dairy Blends, and Spreadable Dairy Blends) - Global Industry Analysis, Size, Share, Growth, Trends and Forecast 2017 – 2022”.